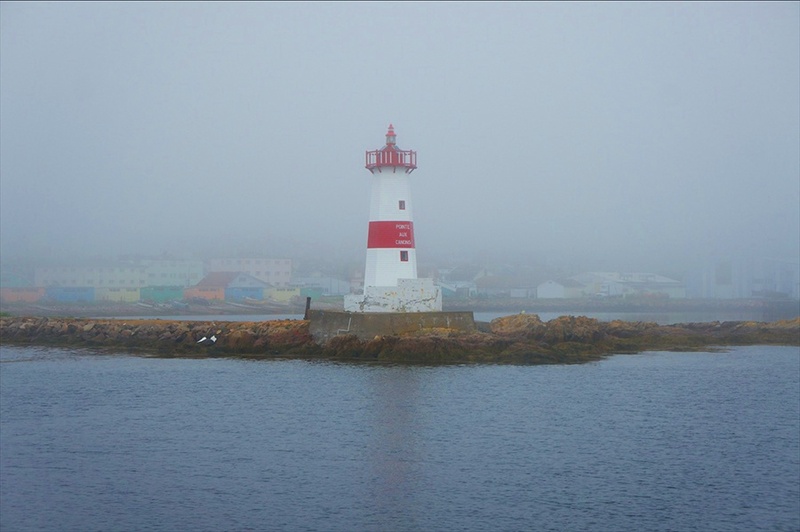 Although it’s called Saint Pierre and Miquelon, there is also Langlade. The town of Langlade is a summer community for people from Saint Pierre. About 600 people relocate here for the warm months, but nobody stays through the winter. Miquelon on the other hand is the same size, but everyone stays year-round. According to our guide, the population is always around 600 people. That probably works out to about 3 people per square kilometer of land. Hey, can you move over? It’s really crowded here. This morning we took the ferry from Saint Pierre to Langlade. It runs daily to transport passengers and supplies. The ride is a beautiful hour of scenic coastlines and the occasional glimpse of a whale or two if you happen to be looking the right direction. As we approached Langlade this morning, we began to wonder where the dock was. It’s not like you can just pull a ferry up to the shore, unload and push it back out to sea. But Langlade doesn’t have a dock. Instead our crew put on hip waders and shuttled us ashore in a black Zodiac. Had this not been in broad daylight, it would have been incredibly stealth. And had we not shared the Zodiac with a bunch of children headed for summer camp, we might have pretended we were sitting along the edge in scuba gear ready to flip backward into the water. Maybe we can plan that into our next trip. It took them three trips to transport everyone and the luggage to the shore. And with great community spirit, the men formed a line from the Zodiac and passed all the bags hand to hand up to waiting vehicles. Our guide Patricia was there to greet us. Patricia and her husband, Claude, run a wonderful bed and breakfast in Miquelon called, l’Auberge de l’Ile. We can’t say enough great things about it or them. The Tourist Information centre in Saint Pierre had helped us call ahead to arrange for Patricia to be our driver. It was impossible for us to rent a car, so she came with her truck to get us in Langlade and spent the entire day touring us around the islands. This arrangement was ideal. It started with a relaxing coffee break on the vista overlooking the sea, followed with meeting a shepherd, his herding dog and flock, and continued to build throughout the day. We picked wild strawberries and walked barefoot along a beach that felt like our toes were sinking into chocolate mousse. Plus, we saw a pod of seals and had the most delicious fresh snowcrab sandwiches you can imagine. Dale and Elise even thought so and they aren’t big on seafood. This really is paradise. Not only is Patricia a fantastic tour guide, a warm hostess and wonderful chef—she’s one of the best agents/talent scouts we’ve ever had. She arranged for us to meet several people today and has our day jam-packed with interesting characters tomorrow. At this point we’re betting if we asked for a dancing cod, riding a horse, on a red fishing boat, she’d just pick up the phone and arrange it. C’est juste une autre journée au paradis.